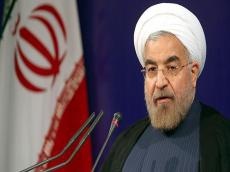 Iran has sincere relations with neighboring countries and is supportive of these relations, Iranian President Hassan Rouhani said during his speech to the public in the Iran’s southern Bushehr Province, Trend reports referring to Islamic Republic of Iran News Network (IRINN). According to Rouhani, Iran has close and sincere relations with Iraq, Oman, Qatar, Turkey, Azerbaijan, Russia, Turkmenistan, Afghanistan and Pakistan. The Iranian president added that Iran is interested in establishing relations with other neighboring countries, including those in the south. "With the commissioning of the Rasht-Astara railway, the Chinese and Eastern European railroads will be united through Iran," he said.